Easy to assemble and disassemble, take it with you for any outdoor sign display needs. 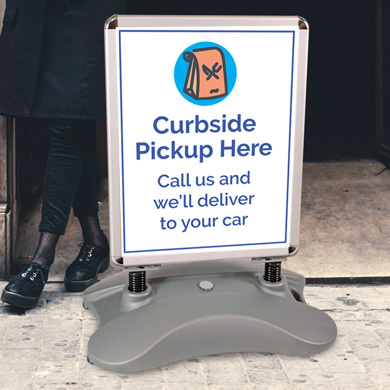 This weather-resistant sidewalk sign holder is designed for advertising your business outdoor in poor weather conditions. Double sided, fits poster signs back-to-back. Windproof design features 3" steels springs connect to a weighted base to resist strong outdoor winds. Water or sand fillable base for optimum stability. Two anti-glare protective sheets protect your graphics in light rains. Aluminum snap-open frames makes it quick and easy to change signs. Round corner frame design provides maximum safety. Heavy-duty plastic bottom with built-in handle and wheels for mobility. Fits signs and posters in 22 in. W x 28 in. H. in portrait orientation. Sign visible area: 21.25 in. W x 27.25 in. H.
Need a 22 x 28 Sign? Custom printed poster #4500 available for purchase separately.